Relax and enjoy the spirit of the South Pacific amidst tropical palms, koi ponds and white-sand beaches. The Great Ceremonial House – the centerpiece of the resort features an atrium with a large tropical rain forest boasting over 75 species of plant life and several waterfalls. The Polynesian’s 847 rooms and suites are situated around the Great Ceremonial House most of which were recently renovated in 2013. Transportation to the Magic Kingdom and other parks is a breeze at the Polynesian. Magic Kingdom is a monorail or boat ride away. Travel by bus to Disney’s Hollywood Studios and Animal Kingdom. Travel to Epcot via the monorail through the Ticket and Transportation Center. Water Fun – Thrill or chill at Nanea Volcano Pool, which features a huge volcano, waterfall and waterslide. The zero-entry pool beckons swimmers while water play areas are available for the kids. You can also relax at the Polynesian East Pool, the all-ages leisure pool tucked amidst the gardens. In addition to swimming, resort guests also enjoy, jogging trails, sail and motor boat rentals, fishing, surrey bikes, volleyball and many more activities. Schedule A Kid-Free Night out Disney provides great programs for kids allowing mom’s and dad’s a much deserved night out while knowing their kids are well cared for and having a blast at the Never Land Club! In-room childcare is also available for those with small children. NOTE: Due to the popularity of all Disney Resort restaurants, reservations are a must and can be made as much up to 180 days ahead of time. Spirit of Aloha Dinner Show – an all-you-can-eat, family-style luau complete with hula dancing and fire knife performances. Kona Cafe – Enjoy a breakfast, lunch or dinner of American dishes with a South Seas flair. Family-friendly and relaxed, the Kona Cafe will delight visitors as well as entertain with its’ onstage pastry kitchen where chefs prepare everything from creme brulee to pineapple upside-down cake. Tambu Lounge – Specializing in tropical drinks and Hawaiian-inspired appetizers. Full-bar menu is also available. 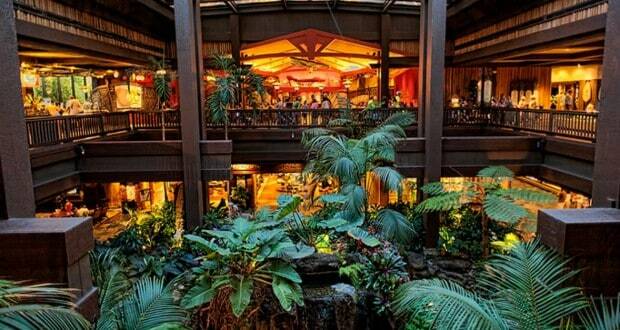 As of 2008, Disney’s Polynesian Resort is certified green lodging property with the state of Florida. NOTE: The Polynesian Resort is undergoing construction and is not slotted for completion until 2015. To ensure desired resort amenities, call ahead for details on what may be unavailable. For more information about Disney’s Polynesian Resort, contact an Authorized Disney Vacation Planner. They’ll help you get the best price for your vacation, share their expert advice and their services are totally FREE! Becky is a full time wife, mother and graphic designer. She loves all-things Disney and loves sharing her advice and experiences on DisneyFanatic.com.